The foundations of America’s relationship with China crumbled last week. The key developments were a lurch by the US towards protectionism and a swing by China towards one-man rule. For the past 40 years, the world’s two largest economies have both embraced globalisation, based on understandings about how the other would behave. The Chinese assumed that the US would continue to support free trade. The Americans believed that economic liberalisation in China would eventually lead to political liberalisation. Both of these assumptions are now shattered. On Sunday, China’s National People’s Congress rubber-stamped a constitutional change that would allow President Xi Jinping to rule for life. Three days earlier, President Donald Trump announced tariffs on steel and aluminium and tweeted that “trade wars are good and easy to win”. But Mr Trump’s breezy confidence ignores the dangers involved in unleashing a trade war. Those risks are not simply economic: a trade war makes it more likely that, one day, the US and China could slide into a real war. Until now, the geopolitical ambitions of a rising China have been restrained by the need to keep the west’s markets open. But if America’s protectionism escalates, then China’s calculations will change. And there is, in fact, every chance that Mr Trump’s tariffs are just the opening salvo in a trade war. The measures announced last week were global in nature and do relatively little direct harm to China. But future tariffs, particularly those targeting intellectual property, are likely to be aimed more precisely at Beijing. Peter Navarro, the White House trade chief is, after all, the author of a book called Death by China. America’s economic challenge to China comes at the same time as an increasingly confident Beijing ramps up its own ideological and geopolitical challenge to Washington. During the Xi years, China has embarked on an ambitious programme of “island building” in the South China Sea, to re-enforce its territorial and maritime claims. The broader goal is to end US dominance of the western Pacific — the site of the world’s most important commercial sea routes. At the same time, Beijing’s new authoritarianism is promoted not just as a governing method suitable for China, but also as an alternative global model to western democracy. As the two countries slide towards confrontation over trade, territory and ideology, so the sense of grievance on both sides is likely to increase. The Chinese and American presidents are both nationalists who frequently stoke feelings of wounded national pride. Mr Trump has claimed the world is laughing at America and that China has raped the US. Mr Xi has promised to preside over a “great rejuvenation” of the Chinese people — that will finally bury the “century of humiliation” that began in 1839, when the country was invaded and partially colonised. The emergence of leaders such as Mr Trump and Mr Xi is a reflection of broader ideological shifts in both countries. Thirty years of stagnant or declining real wages for most American workers have comprehensively undermined the belief in globalisation and free trade in the US. Mr Trump was the loudest protectionist voice in the 2016 presidential field. But even his opponent, Hillary Clinton, was forced to repudiate the Trans-Pacific Partnership free trade agreement that she had once promoted. Successive American presidents also believed that capitalism would act as a Trojan Horse — undermining one-party rule within China. As former US president George W Bush once said: “Trade freely with China, and time is on our side.” The American establishment believed that a more liberal China would be less likely to challenge the US on the international stage. One of the central tenets of liberal internationalism is that democracies do not wage war with each other. But political developments in Xi’s China have refuted the expectations of the liberal internationalist worldview that shaped successive American presidencies. China has not become more democratic. Nor is it any longer willing to live quietly within a US-designed and dominated world order. These changes reflect a growing sense of national power within China, which has given prominence to new ideas and thinkers. In the pre-Xi era, Chinese leaders and academics liked to stress the mutual dependence between their country and the US. The conventional argument was that China’s rapid development was taking place in the context of a US-dominated world — and therefore there was little point in challenging America. But this Chinese version of liberal internationalism is no longer common in Beijing. More recently, Chinese intellectuals have begun to argue that “the US-led world order is a suit that no longer fits” — in the words of Fu Ying, chair of the foreign affairs committee of the NPC. This new combination of a protectionist and nationalist America, and an assertive and nationalist China, is potentially explosive. But there are also aspects of Mr Trump’s ideology that may make conflict less likely. Unlike all his recent predecessors, the US president has little interest in promoting democracy abroad. He is likely to be unconcerned by Mr Xi’s move towards one-man rule. Indeed, he may even envy it. Jay Powell is widely expected to preside over his first interest rate increase as Federal Reserve chair on Wednesday. However, the focus for many investors is less on this week’s likely quarter-point move and more on what happens next. The central bank has been sending more hawkish signals this year as officials suggest they will not stand by and let the economy overheat given the buoyant labour market and massive fiscal stimulus being delivered by Congress. The question is how Mr Powell and his colleagues deliver their prognosis without spooking the markets. There are still mixed feelings within the Fed about pushing through a series of rate rises at a time when inflation remains doggedly below the central bank’s official target. The Fed is likely to lift rates for the first time in 2018, adding a quarter point to the federal funds target range, which stands at 1.25 per cent to 1.5 per cent. Traders are fully expecting the move: according to figures from CME Group, the odds being put on an increase by the markets are more than 90 per cent. No dissents seem likely, and the programme to gradually shrink the Fed’s balance sheet is set to continue uninterrupted. The market’s attention will be on accompanying economic forecasts which show what officials are thinking about the economic outlook and the right level of interest rates over the coming years. Attention will also be on the language in the Fed’s post-meeting statement, issued at 2pm US eastern time, and on Mr Powell’s first press conference as Fed chairman. What will the forecasts show? The Fed in December predicted GDP growth of 2.5 per cent this year, 2.1 per cent in 2019 and 2 per cent in 2020, with unemployment dipping to 3.9 per cent this year and next before returning to 4 per cent. The big change since then is the arrival of the full details of the GOP’s $1.5tn tax cut, plus a congressional deal to lift caps on federal discretionary spending for the next couple of years. US central bankers have made no secret of the magnitude of those changes. Lael Brainard, a Fed governor, said in a recent speech that the tax legislation alone could add as much as a half percentage point to GDP growth this year and next. On top of that, the congressional spending deal should raise federal spending by 0.4 per cent of GDP in each of the next two years, she said. Countering that is the prospect of a sluggish start to the year growth-wise, with the Atlanta Fed predicting growth of 1.8 per cent in the first quarter. But there is a good chance the Fed’s median growth, inflation and unemployment forecasts see upgrades. This has implications for monetary policy, as Mr Powell suggested in a congressional hearing last month. What about the interest rate outlook? The Fed’s median projection in December was for three rate rises this year, followed by another two in 2019. By 2020 it was predicting rates would reach 3.1 per cent, above the estimate for rates over the longer term, which stood at 2.8 per cent. One of the big questions is whether the 2018 median forecast could move to four rate rises; analysts say it would take four officials to shift their position upwards for that to happen, which is by no means certain. Forecasts in 2019 or 2020 could also move, and there is speculation that the Fed lifts its estimate for the longer-run interest rate. This would reflect a more optimistic view of the economy’s performance and of the interest rate needed to keep it on an even keel, taking on board stimulative fiscal policy and improved global growth. The messaging around these forecasts will be carefully nuanced. The Fed wants to stick with its “gradual” approach to rate rises, and its new chairman will be keen to stress continuity with the cautious approach adopted by his predecessor Janet Yellen. The Fed has presided over years of below-target inflation, and some officials want to see clearer evidence that price growth is on the right track before moving. Further complicating the outlook is the possibility that the short-term boost from fiscal policy subsides sharply early in the next decade, reducing the fuel behind the recovery. The Fed will update the language in its post-meeting statement when this is released at 2pm. Mr Powell will then face the media from 2.30pm, with questioners likely seeking his views on topics ranging from a possible trade war to the risks of an overheating financial market. Mr Powell has emphasised his appetite for further transparency, so he could be asked if he wants to hold press conferences more often. Such a move would be significant, as markets would view it as freeing the Fed’s hand to move rates more regularly. The Fed can change policy whenever it chooses, but it has tended to confine big monetary policy announcements to the four meetings a year when the chair addresses the press. SOME things about Warren Buffett never change, including his non-stop jokes, famous annual letter and his reputation as the world’s best investor. What is less understood is that over the past decade Mr Buffett’s company, Berkshire Hathaway, has sharply altered its strategy. For its first 40 years Berkshire mainly invested in shares and ran insurance businesses, but since 2007 it has shifted to acquiring a succession of large industrial companies. In some ways it is hard to criticise Berkshire. Its shares have kept up with the stockmarket and its standing is exalted. It is the world’s seventh-most-valuable publicly traded firm (the other six are tech concerns). But Mr Buffett’s behemoth is a puzzle. Its recent deals have had drab results, suggesting a pivot to mediocrity. It has been quite a spree. Since 2007 Berkshire has spent $106bn on 158 firms. The share of its capital sunk into industry has risen from a third to over half. The largest deals include BNSF, a North American railway, Precision Castparts (PC), a manufacturer, various utilities, and Lubrizol, a chemicals business. Further transactions are likely. Berkshire has roughly $100bn of spare cash. In his latest letter, published on February 24th, Mr Buffett complains about high valuations but says there is a possibility of “very large purchases”. Berkshire thinks of itself as a friendly buyer to which families and entrepreneurs are happy to pass on their crown jewels. There is something comforting about its mission to be a home for old-school businesses run by all-American heroes. Yet it is not an obvious formula for superior performance. Berkshire must pay takeover premiums and has $64bn of goodwill. It enjoys no synergies of the sort corporate buyers claim and unlike private-equity firms does not overhaul management at its targets. There is no clear reason why being owned by Berkshire improves performance. Mr Buffett has largely missed the past decade’s tech boom, the big force behind the stockmarket. Can Berkshire turn water into wine? Schumpeter has attempted to answer this by crunching the numbers, using a certain amount of guesswork. There are two ways to capture how Berkshire creates value, both of which Mr Buffett has in the past endorsed. One is measuring Berkshire’s own book value and how this increases. The other is to examine its “look through” profits, which are made up of the earnings of its wholly-owned businesses as well as its share of the earnings from the firms in which it owns small stakes. Over the past five years its book value has grown by a compound annual rate of 11%. Berkshire’s look through return on equity (ROE) has usually been 8-9% (all further figures exclude the impact of a $29bn one-off gain booked in 2017 relating to America’s law slashing corporate tax). 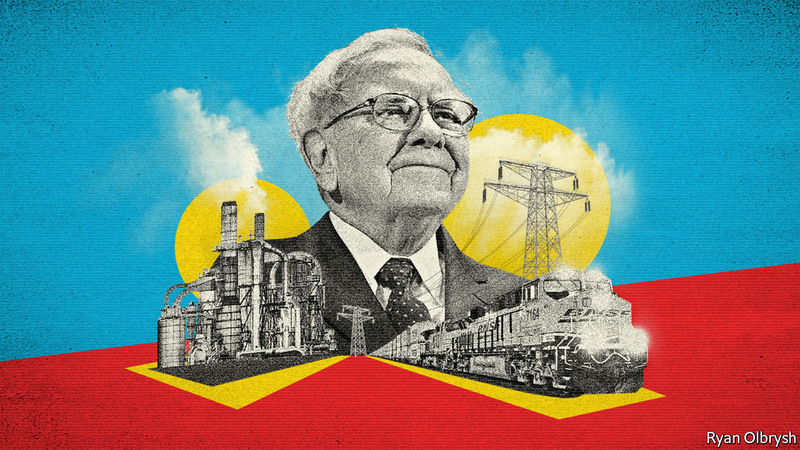 Those results are worthy of Mr Buffett, but the next step is to split Berkshire into two areas and examine the larger part—its acquired industrial businesses, spanning its railway, energy, utility, manufacturing, services and retail units. These have a total book equity of $191bn, most of which was built up in the past decade. By this measure Berkshire is the second-largest industrial concern in America. The industrial arm’s operating performance is bog standard and, once you include the goodwill, its ROE is a weak 6%, down from 9% in 2007 before Berkshire shifted course (these sums exclude the amortisation of intangible assets, which is in accordance with how Mr Buffett assesses profits). The industrial businesses’ lacklustre record mean they account for about 60% of Berkshire’s sunk capital but have generated only about half of its look through profits, and 40% of its growth in book value over the past five years. For the five big industrial companies where figures are consistently available, total profits have risen by 4% a year since 2012, which is no better than a basket of similar peers. Profits at BNSF, for example, have risen only just above inflation and in line with other railways. Speaking to CNBC on February 26th, Mr Buffett suggested that a sixth business, PC, had not met its own internal targets. Since Berkshire cranks out an annual return of about 8-11% a year overall, the other area of its business, its financial operations, must have done much better. These include insurance underwriting, leasing, stock-picking, gains on derivatives and lucrative one-off transactions struck by Mr Buffett, for example when he bought bonds issued by Goldman Sachs and General Electric during the financial crisis. Overall, Berkshire’s financial arm has a solid average ROE of 11%, achieved with low leverage. Why, then, is Berkshire making large industrial acquisitions? There is a chance that profits will grow faster in future, pushing up the low ROE of the acquired businesses, yet most of them are mature. Or Berkshire may hope that selected acquisitions, when valued in line with their listed peers, will show a big rise in their value since being bought, which accounting profits do not capture. BNSF, which Berkshire bought in the depths of the crisis in 2009, has yielded an annual return of about 15% if measured in this way. However the other deals are unlikely to look nearly as good: two thirds of them (by value) took place after the end of 2011, once markets had bounced back from the crash. Berkshire has three possible paths forward. One is that Mr Buffett and his partner, Charles Munger, return cash to shareholders and accept that Berkshire must be less ambitious. The two men do not seem ready for this. A second is that they do more big takeovers now, with stockmarkets high. That would likely depress Berkshire’s returns for years and make it more reliant on fireworks from its financial arm. The third path is that Mr Buffett and Mr Munger sit and wait, hoping for a stockmarket crash, when Berkshire’s war chest will let it pick up bargains that make better returns than its recent acquisitions have done. Twenty years ago this strategy would have been uncontroversial, but the two men are aged, respectively, 87 and 94. Berkshire is enough of a conundrum to perplex even the world’s greatest value investor. LPL chief investment strategist John Lynch, who measured the S&P 500, says the index is in the middle of its second-longest and second-greatest run ever. The S&P 500 posted a 418 percent gain from October 1990 through March 2000, well ahead of its current 302 percent climb as of Jan. 26 as technology stocks boosted the index more so than the Dow. To sum up, there have been a lot of bull markets over the past century, and they all ended eventually. Why did they end? Usually because equity bull markets are part of broader expansions that eventually build up imbalances that force a retrenchment. The longer the good times go on, the more cocky investors and entrepreneurs become and the more dumb investments they make. These don’t generate sufficient cash flow to cover the interest on the related debt or otherwise satisfy backers, and eventually fail. Investors who lose money on failed projects stiff their creditors and so on, down the food chain until everyone is shell-shocked and risk-averse. Stock prices plunge, the economy contracts and the cycle begins again. The key sentence here is “the longer the good times go on,” because the malinvestment is both cumulative and progressive. That is, the number of bad decisions rises as people become convinced that “this time it’s different” and they can’t lose. TWhy the current expansion/bull market has so long is open to debate. What’s undeniable, though, is the vast amount of malinvestment that has accumulated. The biggest example might be corporations borrowing hundreds of billions of dollars to buy back their stock at record high prices. See Record Buybacks at Worst Possible Time. If those equities subsequently fall by half in a future bear market, today’s buybacks will end up as an object lesson in corporate hubris. Another undeniable fact is that based purely on historical precedent, this bull market is ancient, which puts it near, if not at, its end. The decision by U.S. President Donald Trump to meet with North Korea’s Kim Jong Un shocked the world, but in hindsight maybe it shouldn’t have. First, Trump has said on several occasions that he would be willing to meet with Kim, and numerous lower-level meetings took place in the months prior to this announcement. Second, and more important, the logic of what has happened since the situation reached crisis levels in early 2017 makes such a meeting a reasonable next step. The U.S. had contemplated military action to destroy the North Korean nuclear capability several times over the years, but when it became clear and public in early 2017 that the North was close to posing a direct nuclear threat to the United States, the impulse was nearly overwhelming. The challenges of such an assault were evident. Locating all the nuclear facilities would be difficult, and the U.S. couldn’t be certain of their complete destruction from the air. What’s more, the North Koreans had installed massive artillery concentrations north of the Demilitarized Zone, which could inflict severe casualties and cause enormous damage to South Korea’s capital, Seoul, and to the country’s industrial base. An attack on the North’s nuclear facilities, itself complex, would have to be combined with urgent suppression of this artillery concentration. This could be done, but not quickly, and in the meantime the shelling would wreak havoc. If I am right – if South Korea wants both a deeper relationship with the North and U.S. guarantees of protection, and if North Korea would accept a U.S. guarantee that it does not want to push regime change in the North (something Pyongyang has long rejected) – then there may be something to talk about, and it would have to be discussed at the highest levels. It is probably impossible to assuage North Korea’s concern about the U.S. presence in South Korea. It is also hard to envision how to create a relationship between a democratic, industrial South Korea and a tyrannical, primitive North. But the elimination of the threat of war, if it can be guaranteed, might be enough.